Namaste™ Essential Oil Blend is a Blend of 100% Pure Therapeutic Grade Essential Oils of Coriander, Palmarosa, Tumeric, Sage, Sandalwood, German Chamomile, Bergamot, Fragonia, Frankincense, Rosemary, Mandarian Red, Sweet Orange, & Sweet Marjoram in a Jojoba Oil Base. Namaste’™ Nama means bow, as means I, and te means you. Therefore, namaste literally means “bow me you” or “I bow to you.” Namaste’ is an essential oil blend created to help remind us that it is important to honor the both the Divine Spirit within as well as honoring and bowing to the Divine Spirit in all beings. This is a 13 essential oil blend that also helps us connect to our own natural inner cycles. May you find your inner calm in the midst of anything or anyone that challenges you by remembering we are all Spirits having a human experience! Individual properties of the essential oils are described below. Coriander: Energetically, coriander essential oil been used to help a person honor their own needs and boundaries with more flexibility for the way in which things should be done. It may help a person who feels controlled by others or by their own demands for perfection or conformity, and helps to let go of approval from others. It walks you outside of your own box or comfort zone to truly find yourself. Palmarosa: Palmarosa helps to open the heart chakra & connect with mother earth energy which in turn provides us with a sense of security and unconditional love. Palmarosa releases emotions of shut down, resentment and powerless that come from keeping a closed heart. When we embrace the energy of mother earth we feel protected and nourished from within. Turmeric: Tumeric has anticancer effects. There are also antioxidants in turmeric that protect the brain, kidneys, and liver from damage by alcohol, drugs, radiation, heavy metals or chemicals. When we exist in a more healthful place form within, because our organ systems affect our emotional body, we recognize the Divine within others. 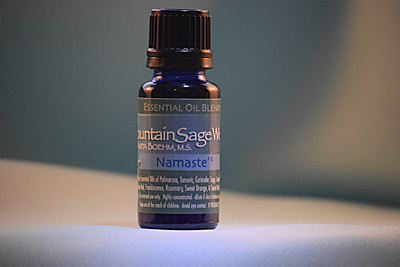 Sage essential oil aids in clearing the throat chakra – the bridge between our area of consciousness & our heart center. It also activates all 7 main chakras and relieves depression and mental fatigue. Sandalwood is an essential oil highly regarded by Chinese, Ayurvedic, & Tibetan medicine for its therapeutic effects as well as its ability at being able to center the mind in meditative yoga practices. It is great as a tonic for a hyper active mind & is considered to be an anti-depressant as it can help to relieve agitated emotional states, over thinking, & worry. Sandalwood also accesses the root chakra to ground us. German Chamomile is a relaxant, sedative, eases anxiety, worries, nervous system shock, tension, anger and fear. German chamomile essential oil gives patience, peace, and calms the mind. Bergamot accesses both the throat & heart chakra –allowing one to speak their truth from a place of compassion & unconditional love. FragoniaTM essential oil – a relatively new essential oil from Australia. Fragonia is unique in its ability to work at a deep level, helping to release, decongest, & disperse blockages; while having the capacity to bring forth harmony, peace, & balance emotionally, physically, & spiritually. Frankincense revitalizes the body & mind when a person is mentally or physically exhausted. It is also stabilizing, centering, & helps to focus energy. Rosemary enhances mental clarity while aiding alertness & concentration because it stimulates & strengthens the central nervous system. Rosemary also lifts spirits, counters depression, balances intense emotions, & controls mood swings. Mandarian Red essential oil accesses both the 3rd & 4th chakras as it balances the mind & harmonizes mood & feelings. Sweet Orange balances emotions – either relaxing or stimulating as needed. It is revitalizing when lethargy sets in, calms nerves, brightens gloomy feelings, combats anxiety & insomnia, awakens creativity, inspires harmony, & promotes self-awareness. Sweet Marjoram has profoundly soothing & warming properties that are comforting to both the body & mind. It is calming & sedative; helpful in relief of anxiety & tension, insomnia, general debility, hysteria, & can comfort those suffering from intangible emotions such as grief, loneliness, sadness & rejection. Sweet Marjoram is also effective in relieving headaches & migraines. Suggested Use: This blend may used daily using any of the following methods. Place a drop under nose or onto specific points (i.e., acupressure points, trigger points, etc.) for additional therapeutic effects. Use in an aroma diffuser (just a few drops in water) for therapeutic inhalation effects. Add a few drops to a bath, vaporizer, compresses, etc. or add additional base oil for massage. Essential oils are also great for enhancing any mindful practice including: meditation, yoga, & Qigong. Therapeutic effects of essential oils are vast & vary for each oil (i.e., emotional balancing, muscular, circulatory, respiratory, etc.). Do not use if pregnant. If skin irritation occurs, add more base oil (i.e., jojoba oil) or discontinue use. Avoid eye contact, swallowing, & contact to open wounds.